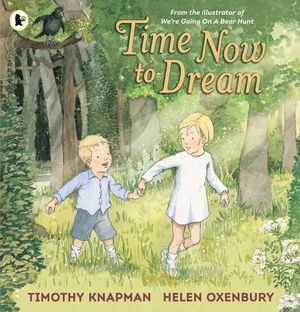 The talented duo of Timothy Knapman and Helen Oxenbury have teamed up to bring us a beautiful picture book that plays on childhood imagination with all its excitement, anticipation and fears. The noise gets closer. What could it be? When it is right upon them, suddenly Alice doesn’t feel so brave anymore. But what about little Jack? Is he brave enough to find out what’s making the noise? This is a delightful read aloud story that will carry kids on a journey as they delve deeper into the forest, keeping their fears in check as they search for the source of the sound. The classic Helen Oxenbury illustrations are soft and enchanting and the children are expressive and relatable. The images get darker and denser as the children find themselves deeper in the forest but the overall soft pastel colour palette and the children's light clothes and blonde hair prevent the images from getting too intimidating. This is a lovely sibling story with imagination and adventure and a sense of accomplishment at facing fear. It has a good pacing and rhythm to it and despite the storyline seeming a little sinister, it is actually a gentle story with a comforting ending. A perfect book for bedtime reading.